It's In The Details: Welcome the Winning Query Kombat Mentor MarcyKate Connolly! Welcome the Winning Query Kombat Mentor MarcyKate Connolly! A big welcome to one of our Query Kombat mentors. MarcyKate coached the Grand Champion, Jungle Vendetta to victory. We had to share her words of wisdom with you. What did you think when asked to take part in a query contest as a mentor? It sounded fun! I entered a metric crap-ton (yes, that’s the technical term) of contests when I was querying, so I liked having an opportunity to help other writers still in the trenches. And did the Query Kombat mentor process go smoothly? I believe you had two MG entries. What did you love about your entries and how did you make them better? It went very smoothly. I had two AWESOME mentees who did a fabulous job polishing up their queries and first pages. I loved that they both had such voice (which is really, really hard to do! ), and their willingness to take critique (not everyone does this well either, unfortunately). Also, they both had such unique concepts! The first thing I did was ask them to send me their query and the first 5 pages of their manuscript. Even though the judging was only on the first page, I wanted to get a fuller sense of the opening. Beginnings are hard, and sometimes the right starting point isn’t until later on. Luckily both mentees had found a starting place that did feel right to me. Did you enter contests when you were back in the query stage? And how did you eventually snag such a fantastic agent? Oh yes, I may have earned the nickname “Contest Queen” among my inner circle… I love pitch contests, I think they’re a fantastic way of getting your work out there and even if it doesn’t win the contest, it still gets exposure and can lead to other opportunities. For instance, I had a few agents who remembered my pitch from a contest and tracked down my website to ask for pages or to query them with my next book (and they weren’t even schmagents!). Putting yourself out there is an important part of the process, so you may as well get working on that now. Also these contests put you in touch with the online writing community, which is INVALUABLE. However, despite my deep and abiding love of contests, I got my agent the old fashioned way – the slush pile. Did you do a cartwheel or run around the house like crazy when you got your agent offer? Same with your publisher? We want to experience it through you! The first publishing offer was a little different. Suzie sent the manuscript to a bunch of editors on a Thursday afternoon and by Monday we already had interest from two. I was determined not to get my hopes up too high because interest doesn’t always translate to a book deal – it means the editor loves it, but now they need to convince a room full of people to love it too. I figured it would be a long haul, so while I was thrilled, I tried not to panic about it too much. I know you have an MG yourself, Monstrous, that will be published next year. Tell us a little about it and share if you have a release date yet. MONSTROUS is an upper MG fantasy that’s Frankenstein meets the Brothers Grimm told from the viewpoint of the monster as a teenage girl. There’s a slightly longer description on Goodreads if you like. I don’t have an exact date yet, but it is currently scheduled for Winter 2015. What is an important difference between the YA voice and MG voice? Ah geez, you had to ask this didn’t you? Honestly, it’s a I-know-it-when-I-see-it thing, especially since there’s a whole range of voice types for both YA and MG.
We’d love to have you back as a mentor next time. Are you up for it? YES, absolutely! It was fun! Bio: MarcyKate Connolly is an author and arts administrator who lives in New England with her husband and pugs and writes weird little books. She’s also a coffee addict, voracious reader, and recurring commuter. She blogs about all those things and more at MarcyKate.com, and can often be found on Twitter. 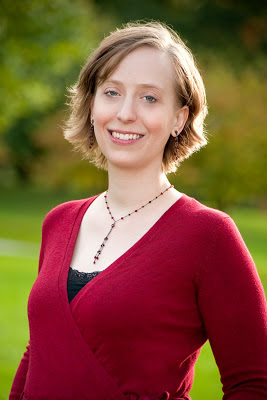 Her work is represented by Suzie Townsend of New Leaf Literary & Media, and her debut upper MG fantasy novel, MONSTROUS, will be published by HarperCollins Children’s Books in Winter 2015. And remember the SWEET 16 starts July 8th. The top sixteen Query Kombat finalists will go before agents and hopefully get tons of requests! So cool to learn more about MarcyKate. She was an awesome mentor! Can't wait to read Monstrous!